Order of the Quill: Gamehole Con, Hounded, and Beyond! Gamehole Con, Hounded, and Beyond! It has been awhile, so there is quite a bit of exciting news to share. First of all, I just got back this week from Gamehole Con in Madison, WI. It was a fantastic convention, made so by great friends and great roleplaying games! Some of my personal highlights included: Eating free hotel breakfast with Metemorphosis Alpha's Jim Ward, Having a card-based drink off against +Jen Brinkman in Red Dragon Inn, playing Memoir ‘44 with +Doug Kovacs , taking +Brendan LaSalle on a Minneapolis DCC RPG community ride through space on a tavern drifting through the cosmos, and playing through a Zork-like RPG experience with the creator of Flux, Andrew Looney! And of course gaming with +Jason Hobbs , +Meredith Spearman , +Jason Bossert , +Forrest Aguirre , +Jon Carnes , +Trevor Hartman (Rick Spencer! ), +Tim Mulry , +Julian Bernick , +Bob Brinkman , and everyone else. I also picked up some great books and artwork at the Con, including this year’s Gamehole Con limited edition Erol Otus print - plus an original Doug Kovacs DCC rpg ink. The piece is quite different than the normal DCC illustrations. It's composition and collage-like style mean I find something new in it each time I look. I’d love to see more like this! 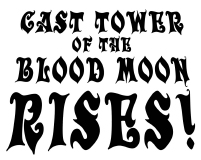 In other RPG news, I’m currently writing a zone for +Thorin Thompson 's Sky ov Crimson Flame Easter Forrest stretch goal! For those who are unaware, Sky ov Crimson Flame is an awesome 0-Level funnel that just came off of a very successful Kickstarter! I got to play in Thorin’s playtest last year and it was a dangerous blast! Finally, although not strictly RPG related, I’ve got to plug the release of my first published boardgame - Hounded, a game of trickery and entrapment, published by Atlas Games. Hounded is a two-player, asymmetrical competitive strategy game based on fox hunting. It’s appearing on all good FLGS shelves this month, so if you’re a boardgamer - please check it out at your local boardgame store!